Nestled in the golden bush grass of an open savanna, a black rhinoceros lies on her side. Her head is haloed by a dried pool of blood. The animal's horns have been sawed off at the stump. Her eyes have been gouged out. "That's a new thing," notes Rusty Hustler, the manager of South Africa's North West Parks and Tourism Board, whose job includes tracking the escalating number of endangered rhinos poached for their body parts. "The Vietnamese have started keeping the eyes for medicine." Hustler and an animal pathologist begin the postmortem. The stench and the proliferation of flies and maggots indicate that the beast, which was found at the Shingalana private game reserve by a local guide, has been dead at least a week. Eight bullet cartridges are scattered near the carcass. Wearing white boots and blue latex gloves, the pair get to work, sharpening a series of butcher's knives, then ripping into the rhino. A metal detector is passed over the exposed flesh. After an hour, the metal detector squeaks, then emits a louder shriek. The pathologist reaches the heart. "That's the kill shot," says Hustler, slicing the heart to uncover an inch-long slug. (See pictures of 10 species near extinction). Unlike the elephant, its pachyderm cousin, the rhinoceros possesses little of the majesty needed to evoke worldwide sympathy. It is shy, low-slung, seriously nearsighted. It does not dazzle with its intelligence. Yet for millennia, these bulky lawn mowers have entranced humans with the agglutinated hair that makes up their horns. Ancient Arabs carved dagger handles from it; Yemen was a popular destination for the animal's parts through the 1980s. Western colonialists in Asia and Africa lined their parlors with rhino-horn trophies and sometimes fashioned ashtrays out of the beasts' feet. Most of all, though, rhino horn was prized in Asia for its purported medicinal value. Ancient traditional Chinese medicine texts recommended the powdered horn for ailments like fever and arthritis, and modern-day practitioners have prescribed it for high blood pressure and even cancer. (Common lore notwithstanding, rhino horn is not considered an aphrodisiac.) So treasured was rhino horn that some of China's tributary states in Indochina were sometimes known in imperial shorthand as the lands of the rhino. 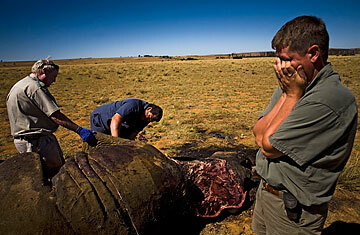 Not long ago, the Asian passion for rhino horn was, in the grand scheme of things, manageable. But now that newly moneyed nations like China and Vietnam are part of trade networks that girdle the earth and move products at jet speed, the fate of the rhinoceros hangs in the balance. This is the story of an animal under threat. There are five species of rhinoceros in the world: two in Africa and three in Asia. Two of the three Asian populations  the Sumatran and Javan varieties  are on the brink of extinction. The story in southern Africa is more heartening. Back in the 1960s, the African black rhino numbered about 100,000, but its population waned to just 2,400 in the early 1990s. Today its numbers have doubled to about 4,800  still low, but heading in the right direction. The real conservation success story has been the dramatic rebound of the African white rhino. A century ago, there were as few as 50 of the beasts alive. Now, because of field-conservation efforts, relocation of animals to safer regions and expanded wildlife refuges, the population has reached around 20,000. But over the past few years, the news from Africa has turned dire. Poaching, once restrained, has skyrocketed. From 2000 to 2007, only about a dozen rhinos were poached each year in South Africa, where nearly 90% of all rhinos live, according to the WWF. But last year, 333 were illegally slaughtered there, nearly all found with their horns chopped off. "Poaching is like a bush fire," says Raoul du Toit, a Zimbabwean environmentalist who won the prestigious Goldman Prize this year for his efforts to nurture critically endangered black-rhino populations. "It starts small, but it spreads and turns into a conflagration very rapidly." Although the current poaching levels are not high enough to suppress the natural population growth of rhinos in southern Africa, they are edging ever closer to the tipping point. "We look on this as an emergency," says Josef Okori, the manager of the African Rhino Program for the WWF. "We are waging a protracted war."